adds up to a launch party showpiece. 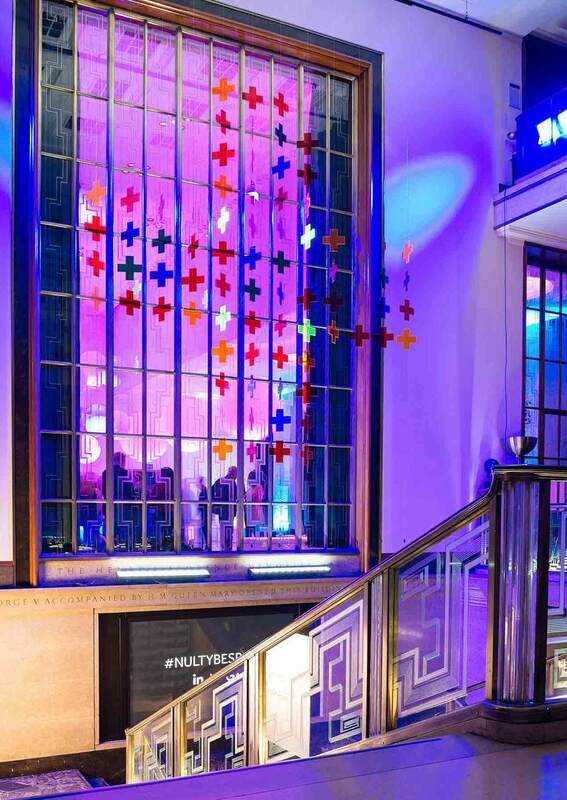 For the launch of Nulty Bespoke we set ourselves the task of creating a lighting feature to wow guests arriving at the impressive venue. Hanging alongside the commanding architecture of RIBA’s Florence Hall, the sculpture had to be impactful and fun, but considerate – and, importantly, the installation on site had to be simple. 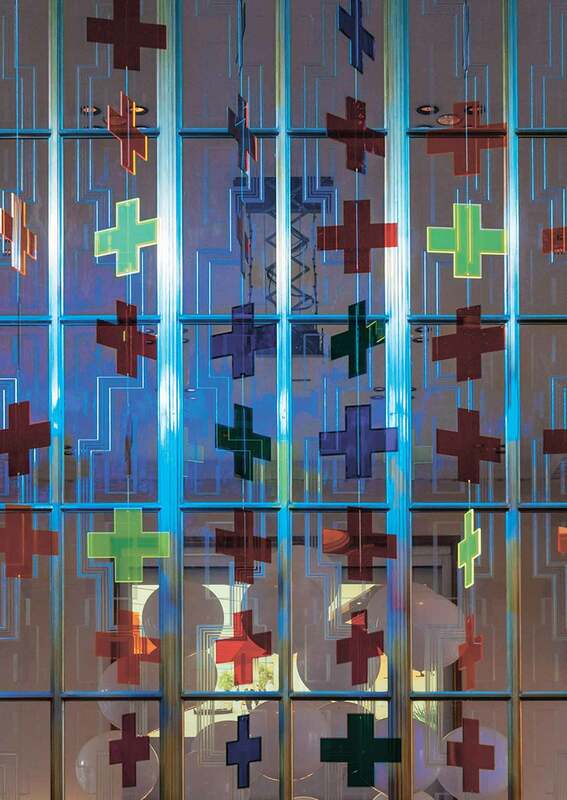 Drawing inspiration from stained glass windows, the eye-catching piece is made up of 80 transparent acrylic pluses, in five different colours. Each piece was carefully chosen and arranged, coming together, using stainless steel braided wire and brass ferrules, as one large plus. The smaller pluses form 12 “drops” that were mounted to a remote control banner bar – this meant the team could slowly raise the bar, and carefully unfurl the sculpture. 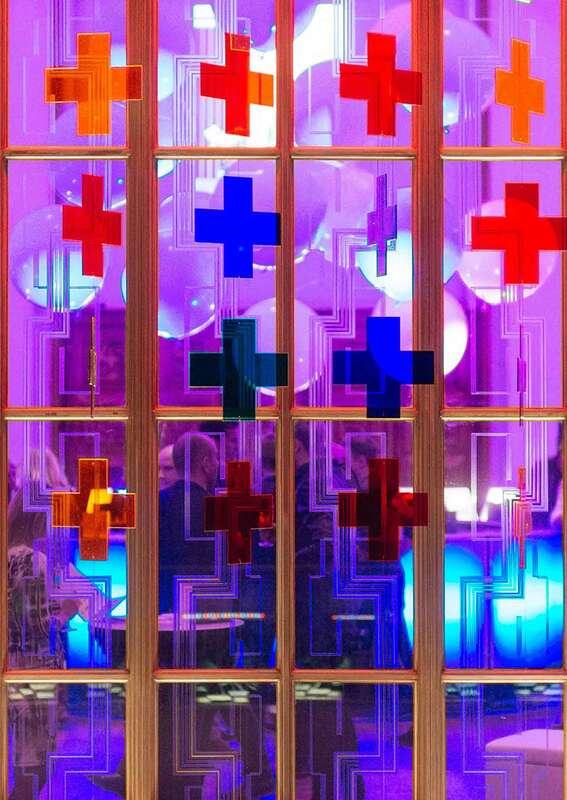 A variety of colour-changing LED floodlights washed the delicate, kinetic installation with light, highlighting its richness against the commanding backdrop: a magnificent, large etched window.